The Kwando private reserve, in northern Botswana is some 2 320 square kilometres in extent, and is home to only 2 Camps, which makes this a remote and untouched area. 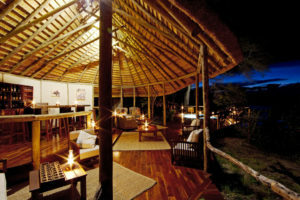 Lagoon Camp overlooks wild floodplains, which are frequented by good numbers of plains game. The camp itself enjoys the shade offered by massive ebony trees. This is a small Camp, with accommodation is in 8 spacious, specially designed, en suite tents. 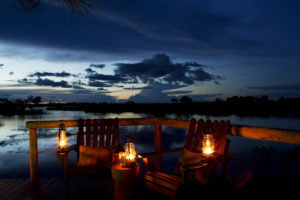 Each tent enjoys a view over a lagoon, formed by the Kwando River. The bathroom has a double basin set in an indigenous Mukwa wood stand, and a flush loo, and the shower is outdoors, in a spacious reeded enclosure. 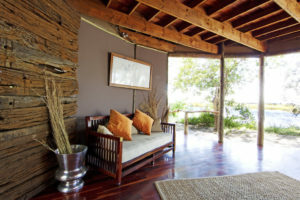 You can relax on you private deck, and enjoy watching the resident hippo in the lagoon. 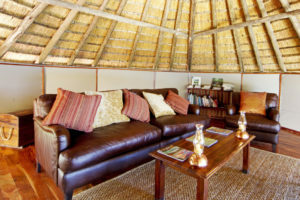 The main lodge area includes the reception area, which continues through to the lounge, dining and bar area, all of which are set under thatch. In additional there is a small plunge pool in which to cool off during the heat of the day. Meals are made from excellent quality home style food, all of which is freshly prepared. Dining is usually alfresco, with the night sky as your ceiling. The river system around Lagoon Camp is a maze of ox bow lakes, fossil riverbeds, reed beds and riverine forests. Game viewing is done on morning and afternoon/ night drives, and from boats. With no more than 6 guests on the game drive vehicle, you are guaranteed of a ‘window’ seat (the vehicles are open). The area is known for its elephant and buffalo, and there are frequent sightings of lion and hyena. 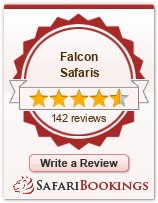 In addition there are plains zebra, giraffe, numerous antelope species, and birds. Night drives are conducted with the aid of a spotlight – giving you the opportunity of seeing the nocturnally active species – of which there are more that you might realise. Guests can also enjoy a peaceful river cruise on the purpose designed double deck barge – whose design allows for the year round navigation of the shallows and oxbows of the Kwando River. You also get excellent views from the upper deck. As the current is quite strong, the barge often floats silently along, allowing you to fully appreciate the peace and solitude of this unique place.